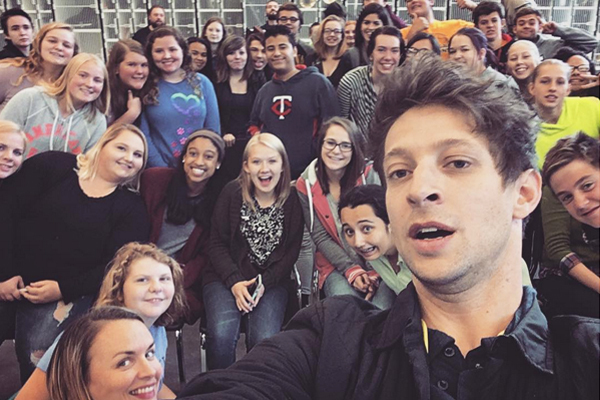 Chris Koza visited a high school music class in Pillager, MN as part of a residency at Central Lakes Community Performing Arts Center in the fall of 2017. Chris Koza is a nationally recognized singer-songwriter-composer living and working in Minneapolis, Minn., where the climate, the mighty Mississippi River and the balance of large city and rural communities offer him continued inspiration. Koza is a previous recipient of Minnesota State Arts Board Arts Tour, Arts Learning, and Artist Initiative grants that engaged youth audiences. Koza brought those experiences to Lanesboro by participating in a variety of inclusive arts activities throughout town that engaged students, seniors, and musicians & writers of all levels and helped mitigate barriers to participation July 10-14, 2018 as part of the Performing Artist Engagement Program. Koza grew up in Portland, Oregon and first moved to Minnesota to attend St. Olaf College. His band Rogue Valley has released a total of nine albums and EP’s. In addition to writing and recording his own music, Koza is also involved with co-writing and arranging songs with other artists, and is exploring commercial and film opportunities. Koza’s songs have been featured on numerous television shows including ABC’s Cougartown; MTV’s Jersey Shore and Matt & Kim; and CBS’s 2013 Superbowl pregame show. International musicblog Americana UK gave Koza’s 2008 solo release, The Dark, Delirious Morning, 9 out of 10 stars, calling it “an unpretentious little masterpiece.” In Fall of 2014, Koza released his latest solo record, In Real Time, and embarked on a national tour in support of his album with indie pop singer-songwriter Ingrid Michaelson. Lately, Koza has utilized his role as a musician in educational and outreach opportunities. During the winter of 2013, Koza was artist ­in ­residence and produced a performance with the Hopkins High School Orchestra. Later that year through the aid of grant funding, Koza and Rogue Valley spent a week in Koochiching County visiting schools and engaging with students before performing at the Backus Community Center in International Falls. Since then he has partnered with numerous other groups throughout Minnesota for residency activities, including: Northfield Arts & Culture Commission, Arcadia Charter School, St. Olaf College, Holmes Theater in Detroit Lakes, MN, Northfield Senior Center, Lake Park Audubon Elem, Jr & Sr HS, Kelliher High School, Indus School, Perham High School, The Reif Center in Grand Rapids, MN, The Edge Center in Bigfork, MN, Washburn High School, among many others. Chris will visit the Surprise Sculpture (12 p.m. – 2 p.m.) and Open Studio (3 p.m. – 5 p.m.) sessions on Tuesday, July 10 to help lead artmaking projects while sharing his experiences as a working artist with participants. Learn more about summer education programs at Lanesboro Arts. On Thursday, July 12, Chris will give a mini-performance at Kenilworth Apartments, following SEMCAC Senior Dining. Learn more about SEMCAC Senior Dining. Chris will participate in a public Poetry and Songwriting Workshop at the High Court Loft on Thursday, July 12 at 6:30 p.m. The regular Open Mic at High Court Pub is taking place on Thursday, July 12 following the workshop and Chris is planning to share some music and stories there. Learn more about High Court Pub. The “Over the Back Fence” Variety Show will feature Chris as a musical guest, and Chris will perform alongside community members in the show. Those interested in participating can attend rehearsals on Tuesday, July 10 and Friday, July 13 at 5:30 p.m. at the St. Mane Theatre. The variety show will take place Friday, July 13 at 7:30 p.m. at the St. Mane Theatre. Learn more about Over the Back Fence. On Saturday, July 14, Chris will present a capstone concert, featuring a full backing band, in the listening room environment of the St. Mane Theatre at 7:30 p.m. Learn more. Thanks to support from SEMAC, a limited number of complimentary tickets to Chris’s concert on Saturday, July 14 were used by participants in the engagement and outreach events listed above. The Performing Artist Engagement Program is made possible by a grant from the Southeastern Minnesota Arts Council, thanks to a legislative appropriation from the arts and cultural heritage fund.